The UAE embassy’s act of kindness is part of their month-long humanitarian drive to honour Women’s Month. A century-old great-grandmother could finally leave something for her children when the United Arab Emirates announced the complete renovation of her Soshanguve home in honour of Women’s Month. To mark and commemorate Women’s Day, the UAE ambassador, Mahash Alhameli, visited the home of Sara Magagula on Thursday as part of the embassy’s month-long humanitarian drive to honour Women’s Month. The great-grandmother was also celebrating her 100th birthday. In honour of Women’s Month, the embassy was identifying Pretoria women in need, in order to assist with entrepreneurial and social needs, he said. 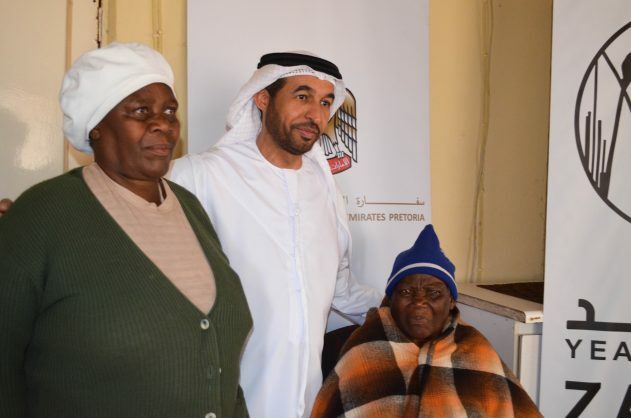 To make Magagula’s life easier, Alhameli also handed her a R10 000 contribution to her healthcare expenses and announced the UAE embassy would fully renovate her 58-year-old home. “The UAE embassy is committed to being an active participant in the growth of the South African community, which the UAE mission now calls home,” said the ambassador. Her delighted son, Andries Magagula, expressed gratitude at the embassy for honouring his mother. “I thank them for choosing my mom. She’s been crying about leaving something for her children, even though she’s tried her best as a single parent,” her son said. The efforts by the embassy were in line with the 2018 Year of Zayed centenary celebrations, to mark 100 years since the birth of the country’s founding father, Sheikh Zayed. “Sheikh Zayed believed that women are half of the society. He is quoted to have said that any country who pursues development should not leave women in poverty and illiteracy. He always said this is in order to uphold women’s rights to work and participate in the building process of the country,” said Alhameli.